Trashed: How economics — and emotion — have turned our garbage into such a mess. This week’s Freakonomics Radio podcast (you can download/subscribe at iTunes, get the RSS feed, read the transcript, or listen live via the link in box above) is about one of our favorite topics: trash. We explore the economics thereof, and the emotions too. We begin, as the best stories do, at sea, with the long, strange journey of the Mobro 4000 garbage barge. (You’ll hear from Duffy St. Pierre, the tug captain who shepherded the Mobro on its trip, and you’ll hear a very dramatic reading from Jonah Winter, who wrote the kids’ book Here Comes the Garbage Barge!) Some of you may remember how the Mobro sailed up and down the eastern seaboard, unable to dump its New York garbage, and how it became a national joke. The notion that we were running out of landfill space got its start by some research that was put out by the EPA that simply counted up the number of landfills over time and saw them diminishing, but failed to factor in that the new landfills that were opening up were much larger than the old ones. … The opposition by various mayors and harbor masters and things like that to the Mobro landing and discharging its contents was purely political. 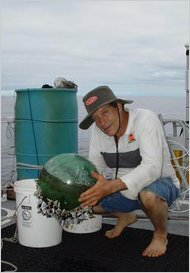 Algalita Marine Research Foundation Captain Charles Moore aboard the Alguita, holding a buoy found in the North Pacific Ocean on a research voyage. So even if landfill space isn’t the problem, how can we do better at controlling our trash? Part of the problem is that many cities have a “Toss-All-You-Want” trash system, whereby there’s no incentive to produce less trash volume. To that end, we talk with Lisa Skumatz, an economist for a Colorado consulting firm that helps cities deal with their trash. Skumatz is a champion of the “Pay-As-You-Throw” model, which targets trash free-riders with significant results. What we found is that overall, Pay-as-You-Throw reduces that amount of trash put in by an average person’s trash bin by about 17 percent, with about a third of that going into recycling, about a third of that going to organics and mulch mowing and that sort of thing, and about a third of it due to source reduction — waste that doesn’t have any cost to deal with anymore because people are donating, people are buying more carefully, and buying less packaging and so on. Alas, the program didn’t turn out exactly as Sanford government officials hoped. Yes it’s a tax grab, and I don’t want to say it’s disguised, but it’s palatable. People who consider this, residents who are tired of higher taxes, things like property and sales and those kinds of things, kind of swallow this thing and say, Okay, this is kind of a user system, where if we generate more waste, we should pay more. And so it’s a politically easy way to get revenue. We also take a look at the unintended consequences of trash fees — which range from emergency-room visits in Ireland to rat infestation in Germany — and we end our trash sojourn in Taipei. Jonathan Forma hand-delivering his trash to a truck in Taipei. Most people seem to like the idea of being paid to throw less out. That is of course until the system comes in and they find other people are placing filled bags at the end of the driveway instead of their own. How can TRASH SAVE LIVES? 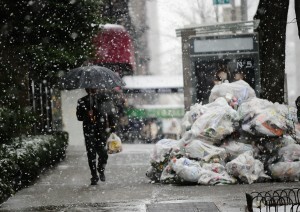 With the recent SnowPocalypse, trash remained uncollected for days. A young man suffering from Holiday Depression decided to end his life. Opening his window, he bid farewell to the cruel world and plunged to the sidewalk. He landed on a pile of trash that save his life. And he vowed to celebrate Christmas in his heart everyday! Of course America isn't running out of landfill space - the Grand Canyon alone will take years to fill up. @Calvin -- Some pay-as-you-go systems require people to buy color-coded bags or stickers, so it doesn't matter where the bag is placed. Re #4: But consider the economics of manufacturing & selling bags for the sole purpose of throwing them away. I've always been puzzled by this: why people buy bags, put their trash in them, and then deposit the bag in a trash can. Or stranger yet, certain neighbors who every fall neatly bag their leaves and deposit them to be collected, then in the spring buy plastic-wrapped bags of compost from the garden center. I just listened to your podcast, and I think you missed one important point on government run pay-as-you-go programs: they quickly become revenue streams for the government unrelated to garbage disposal. This destroys the incentive to not game the system, or your willingness to support the program/participate, no? There is a simple solution to preventing goverment from making trash fees a tax unrelated to trash. Have a pay as you go system where private companies pick up the trash. In La Canada, California they not only have private trash collectors, but there are two of them. If one gives you lousy service or charges too much you can switch. The county has to pay to clean that up, which I think costs more than unlimited trash did. The single minded focus on solid waste also puts a premium on recycling where it shouldn't be. For example those little juice bricks for kids aren't recycled yet result in 90% less solid waste. Despite this, the Gods of Recycling judge them as "bad" for the environment despite the fact that they wind up with less solid waste, less raw material and less energy usage than their glass or metal counterparts. Who needs a Pacific Garbage Patch the size of Texas? We already have a garbage patch the size of Texas. It's called Texas. So the people of Sanford object to taxes and they object to paying for trash removal. Who do they think picks up the trash? Elves? I do recognize that some people will just dump their trash if it isn't hauled away for "free". In our town, a rather generous amount of trash and unlimited recycling are paid for by taxes. If you want to throw out more, then you pay extra. I think that's fair. I'm willing to keep my trash at a modest level and those who aren't pay a small amount for the priveledge. Anyway, I move to Atlanta, and agad, unlike where I lived, they charge you pay as you go to dispose trash here, it is done by private companies rather than the township. Now, I guess it could work either way, but the way it is organized, private ownership means there are around 4 different companies that visit my one small street. An inefficiency right there, burning a lot of extra gasoline, and investing in a lot more equipment and personnel per pound of trash the system collects. So a bit different from the North East then, where you might get fined for not recycling. In a word, disunion. How about we just keep garbage pick up the way it is and not pay for things that the government should have no hand in like, paying for gastric bypass. Yes medicaid pays for obese overeaters to get gastric bypass. Also here in NY ex-cons get welfare right out of the Penn and then if someone actually hires them the employer gets an almost 10K incentive - not to mention ex-cons have entire agencies whose employees sole purpose is to find them work. Garbage pick up is what I pay taxes for, all the other do gooder programs should be up to the individual to be charitable. Won't be listening to your piece, but the topic reminds me of an article in the NYT 18-20 years ago about the strange economic incentives in how trash gets handled. At the time there were several new incinerators on Long Island that were having trouble getting enough trash to operate as designed because it was cheaper for some towns to have their trash hauled to landfills in Indiana! There was a wonderful map showing the route across several states. The mob's influence in trash hauling may also affect some of the decisions. I wonder what has happened to those landfills in Indiana, now some 20 years later? The Pacific Garbage Patch is a myth. Oregon State University Marine biologists have explored the patch and it is only 1% the size of Texas. Seoul has an ingenious pay-as-you-go system that emphasizes convenience (or lack thereof) over pricing. Local convenience stores sell bags for organic and inorganic waste, and these are the only ones municipal trucks will pick up. These are very cheap, so the cost incentive is low. However, the larger bags are harder to find; the ubiquitous smaller bags (5-10 Liters) have to be changed more often and are unwieldy for bulky waste. Throw in the fact that bags can only be used in their local neighborhood (each is uniquely branded) and it becomes very annoying to constantly tie up small garbage bags and run to the store to buy additional ones. After a few months living there, I found myself subconsciously ordering takeout from places that delivered in reusable dishes (they come to pick up the dishes an hour afterward) rather than those using disposable containers. We have pay as you throw here on the Olympic Peninsula in Washington and it works. We also have people who care about the environment and who recycle so there is only minor dumping. Litter we still have. Years ago, Duval County, Florida (Jacksonville) had a huge problem with garbage being deposited along the roadsides. So trash collection became a no-fees county service. After a while, residents got the idea and began setting their stuff on the curb rather than toss it on a roadside. The Taipei video was taken on a street with royal palms (those straight cylindrical things), which indicates something like a government building, school, or hospital. Seriously, why is 25% of the podcast big band music? Why, when one guy complains about the scheme do you cut him off and start blaring music, and the bring up his point on the other side of the break? Then dismiss it? The UK does have a shortage of landfill space and there is now a Landfill tax to discourage use & reduce the amount going to landfill. Local governments (responsible for trash collection and disposal) have a range of recycling, composting and now power generation strategies to avoid incurring cost they'd have to pass on to householders. The best council now recycles 60% of what would have gone to landfill. Private firms that would have previously dumped food processing waste are converting it to electricity via anaerobic digesters - major breweries and whisky distillers, for example use this for grain residue from brewing/distilling. Many people in the UK have a 'wormery' in a plastic bin in the back yard to compost food waste. I forsee competition for the trash resource in future: do you burn it, compost it or recycle it - who's going to get the trash raw material? The US still has space for landfill - but without a negative tax incentive, is there any incentive to recycle, compost and generate power?